Recreate a spa experience at home with the Oh K! 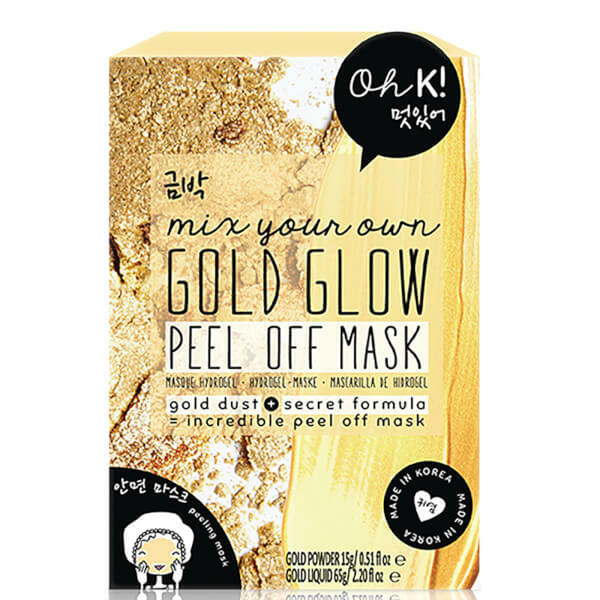 Mix Your Own Gold Mask. Inspired by Korean skincare innovations, the luxurious, DIY face mask contains combines a liquid and powder solution that can be mixed together to create a rejuvenating peel-off mask. Infused with extracts of Gold and Pearl, plus moisture-attracting Hyaluronic Acid, the face mask inspires a radiant glow while locking in hydration for smoother, softer-looking skin. Also contains Vitamin B3 to visibly improve the appearance of skin tone and minimise the appearance of pores. Arrives with a mixing spoon and container. Enough ingredients for two uses. Powder: Glucose, Diatomaceous Earth, Potassium Alginate, Calcium Sulfate, Tetrapotassium Pyrophosphate, Magnesium Carbonate, Hyaluronic Acid, Allantoin, Niacinamide, Gold, Portulaca Oleraceae Extract, Centella Asiatica Extract, Scutellaria Baicalensis Root Extract, Mentha Piperita Oil, Sodium Benzoate, Potassium Sorbate, Synthetic Fluorphlogopite, Parfum (Fragrance), Dipropylene Glycol, Menthol [+/-] Mica, CI 77891 (Titanium dioxide), CI 77491, CI 77492 (Iron Oxides). Liquid: Aqua (Water), Butylene Glycol, Algin, 1,2-Hexanediol, Potassium Alginate, Glycerin, Hydrolysed Collagen, Hydrolysed Conchiolin Protein, Gold, Niacinamide, Hyaluronic Acid, Adenosine, Pearl Extract, Aloe Barbadensis Leaf Extract, Citric Acid, Disodium EDTA, Ethylhexylglycerin, Mica, [+/-] CI 77891 (Titanium Dioxide), CI 77491 CI 77492 (Iron Oxides).